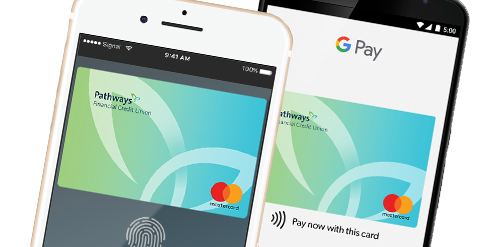 You can now make online purchases and mobile payment solutions at more than 1 million stores across the country using your Pathways Financial Credit Union Debit and Credit Cards with Apple Pay™ and Google Pay™ in your Pathways Digital Wallet. What is Apple Pay and Google Pay? Apple Pay and Google Pay are both mobile payment solutions that lets consumers (like you!) make credit and debit payments at retail and online checkouts using certain compatible mobile devices, like most modern phones. You can check to see if you device is compatible with Apple Pay by clicking here. Google Pay is compatible with most contemporary android phones. Are These Safe Ways to Pay? They’re actually safer than using a card. Each transaction is uniquely protected and encoded. The cashiers never even see your personal information. Look for the Pay Wave® or Google Pay symbol at the store’s checkout machine, and hold your phone near the reader where the symbol is located. See below for a visual example of what to look for. Then, place your finger on the home key, or your Touch ID™, or you may need to enter a pass-code and sign a receipt. Some phones also have facial recognition software as well. The icons below may be one of the prompts you encounter. Keep your phone by the reader until it vibrates and beeps, indicating your payment was accepted. And that’s it! Simply open the Wallet app on your iPhone or compatible Apple device to get started. If you already have a Pathways debit or credit card on file with Apple iTunes®, you can quickly import it into Apple Pay by entering the security code on the back of your card. Simply unlock your phone and wave to use Apple Pay. Go here to learn more about your options and to download the Google Pay app for iOS or Android.